Using a product that you have made yourself is such a rewarding thing. Today I wore the bag that I just made and added the strap from my Alexander Wang Marion bag, the rose gold hardware matches perfectly. An entirely different thing; enjoyed the sunset on a nearby rooftop this afternoon and realized that this spectacle, this light show of pastel and bright colors takes place every single day in a different way, but most of the time we miss out on it. I really like how you incorporated a picture of the sky along with your outfit. Really infuses a certain mood to the whole thing! While reading this post, I think this is kinda wired. I drove home in a car today and all the way I looked into the pastel sky and thought how beautiful the colours are! And that I have to get something pastel blue & lilac now ;) Love the swaeter you have worn! WOW! really really love your outfit! Wow, love the all-white look. And that sunset is just beautiful. The last photo looks so cool with the white against the pretty pastels. En die tas is ook echt heel leuk. Love the look. What color are you nails? Very beautiful poetic and moody post and very good pictures. Awesome, a white outfit like this one! Love me a good old whiteout. I've said it once but I'll say it again: please please please start your own line. Some of us can't use their hands and would love to wear your shizzle!!! The sunset is gorgeous! And the DIY turned out beautifully. in love with your simplicity! nobody styles white-on-white the way you do. perfection! I don't know how you do it, but I find it difficult to find white clothing (tops not counting), but you have an impeccable collection. You look beautiful as always. I looooove. 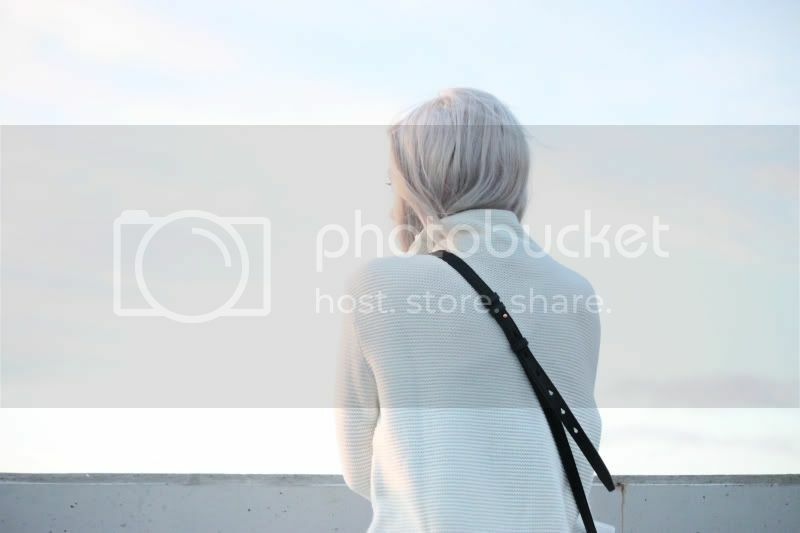 I love how the soft pink of the sky reflects off your skin and hair and brings softness to the stark white and black palette. I'm still in awe of that bag. You're a genius...seriously! I'm always so inspired by you! Amazing pictures , love the total white outfit ! that purse/bag whatever is amazing! need to diy one myself. dit is wit waar pracht in zit! What size sweater did she send you? I bought the same top in a small but it looks so much more oversized on you. Such a pretty look. i'm so in love with these photos, you're amazing ! You make the most beautiful DIY's! love the colours of the photos! so so beautiful. everything about it - you make like the perfect posts!! Your hair makes it all look so ethereal! Love this white on white on white outfit.. Tres chic! 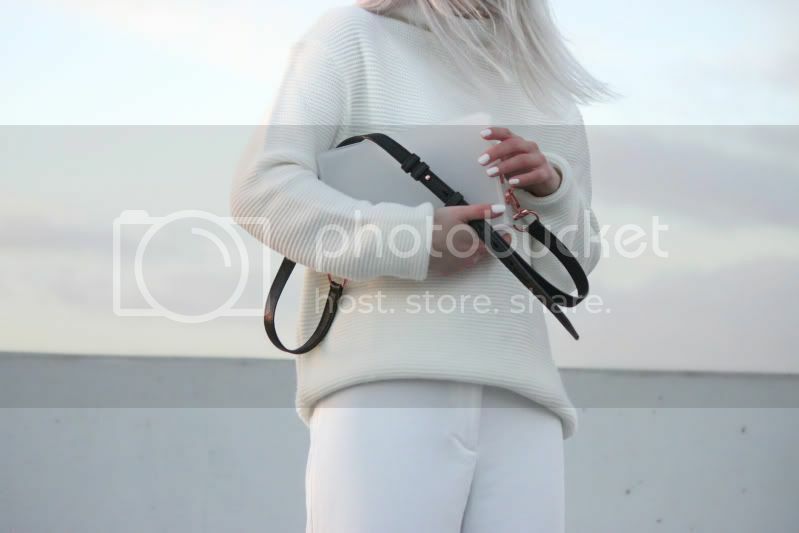 this white knit is just wonderful! your outfit is amazing! nice :) and your white nails are great. I love the VHS bag! Brilliant idea. love the photos, the sunset light brings all the beauty in white textures! +your DIY bag is soooo amazing ! omg! that is one of my favorite movies! such a great compliment! amazing photos, i love your blog!